My imagination carries me away sometime. This is my sister-in-law Mari. She was born and raised in Mexico. When painting this, I thought of those years in history when portraits were sent from Spain between families to arrange marriages. 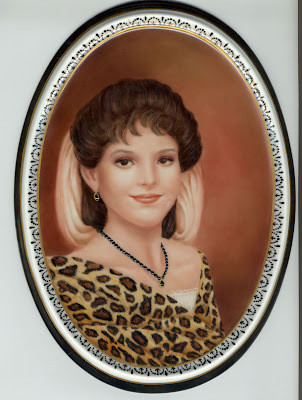 I imagined that in Texas, if my brother had received this painted oval portrait, he would have realized the beauty and sweetness of Mari and would have waited impatiently for her arrival - knowing my brother, he would have probably gone to Spain to get her. I decorated the edge of the tile with black enamel and also used it for Mari's ear ring and necklace.